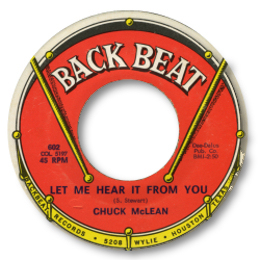 This fine ballad Let Me Hear It From You seems to have been Chuck McLean’s only 45 and it was cut in Chicago by writer/producer Andre Williams who leased a great many tracks to Don Robey in the 60s. The vocal is both powerful and clear toned, with his excursions into tenor range particularly exciting. Love the scream at the end as well. The backing from the Windy City’s usual array of talent is up to their normal high standard with the horns being very well arranged. The funky blues tinged uptempo flip shouldn’t be ignored either. UPDATE ~ Mike Finbow wrties to say that "Charles "Chuck" McLean was one of the lead singers with the Gospelaires of Dayton Ohio, and his spectacular high tenor / falsetto can be heard on many of the group's Peacock recordings from 1965 onwards." Mike refers to the track "A Sad Song" here in "The Soul Of Gospel" article on which McLean shares the lead with Bob Washington who does the narration.